They came, they saw, they laughed – and most importantly, they gave. 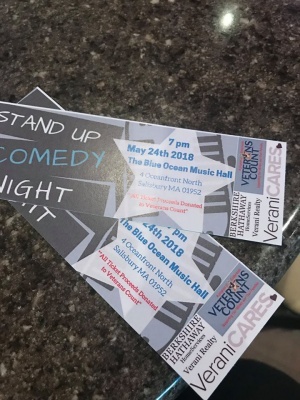 Over 500 people came to the Blue Ocean Music Hall to enjoy the best in local comedy and raise fund for Veterans Count at Berkshire Hathaway HomeServices Verani Realty’s (Verani) first Stand Up Comedy Night. The event raised $20,000 for Veterans Count’s mission to offer critical financial assistance and services to veterans, service members and their families. The event was the first time Verani has held a benefit night, and in a rare move for inaugural events, it completely sold out. It was organized as part of a month-long May Day campaign by the brokerage’s philanthropic and social development arm, VeraniCARES. The VeraniCARES May Day campaign dispersed more than $55,000 to those in need through nonprofits across New Hampshire and Massachusetts during the month of May as a way to celebrate community service. 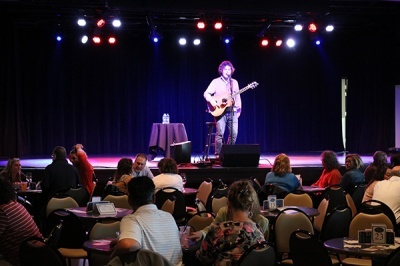 Guests were treated to music from local singer/songwriter Sam Robbins to kick the night off, and enjoyed hilarious acts from Boston fan favorite Christine Hurley, Foxwoods regular Matt Barry, and award-winning writer and performer Paul D’Angelo. In between acts raffles and auctions were held for big-ticket prizes like airline tickets, Boston Red Sox tickets, a Tom Brady football jersey and more, raising even more funds for this critical cause. Veterans Count provides critical financial assistance and services to veterans, service members and their families to ensure their health and well-being. A program of Easterseals, they offer deployment support, mental health support, emergency financial assistance, employment counseling, and substance abuse services. For more information visit http://vetscount.org/nh/.